Olga Sophianou of Kioni recounts that a fellow villager of hers, an older woman named Garoupho, lived alone without any human consolation. Papoulakis felt sorry for her and would go regularly to visit her. A neighbor, however, began slandering her out of envy, saying that she was having a sinful relationship with the Saint. The woman heard these tales and became very upset, but she continued to welcome Papoulakis, without telling him anything, and also offering him food as always. The Saint received information by the grace of God, and told the old lady Garoupho, “Do not be sad. Mitsalou, who falsely accused us, will get ‘the carboni’ (i.e., bad pimple) inside the nose, and no one will be able to greet her besause it will stink”. And indeed it came to pass just as the Saint had said. Olga Sophianou tells us that a certain woman in Kioni violated the fast days of the Church. One Friday, as she was cooking meat, the Saint passed by her house and asked if she was cooking something. Out of shame before Papoulakis, she lied, saying that she was cooking only vegetables. The holy man instructed her, “Open the pot with the food.” She opened it and found the meat full of worms. Thus the Saint taught her in a practical way not to violate the fast. There were also numerous other miraculous events associated with the fast. The Saint’s fervent desire was for his example to be a warning for Christians not to disdain the fasts. The Elder also vigorously urged the people to observe Sunday as a day of rest. Mrs. Paraskevi Vlasopoulou relates that Yiannis Karampoulos’s mother-in-law, from Vathy, was gathering wild greens on a Sunday. Papoulakis requested that she save a little boiled greens for him as well, and he would drop by for a meal. The woman readily saved him a portion. The Saint came to her house and asked her to bring him the food. The lady opened the pot with the greens in order to serve him his portion, but rather than greens, she found it full of worms. Occurrences similar to this were common throughout the island. In this way the Saint wished to set forth the lesson for the Ithacans not to disregard Sunday as a day of rest, since it is a rule of the Church. 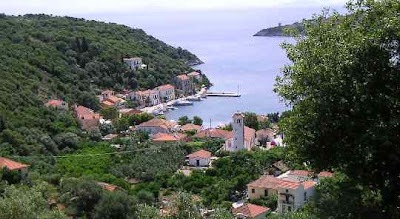 Voula Vlasopoulou of Ithaki attests that there was a poverty-stricken mother, Balatsourena, with three little children. One evening, she had absolutely nothing to give them to eat. What did she do to try to get the children to sleep while still hungry? She lit a small clay oven, like a baking pan, and placed a brick tile underneath it, to look as if it were a loaf of bread — a pitouli, as the Ithacans call it, which is a small pita. “Go to bed,” she told the children, “until the pitouli is ready to eat.” The children got into bed, looking forward with anguish to satisfying their hunger. Their patience was wearing thin, and every so often they would call out, “Mama, is the pitouli ready yet?” “Not yet,” replied the hapless mother, with a rent heart. Suddenly, without having been invited, Papoulakis entered the house and greeted her as always with great kindness and joy. “Good evening. I see here you’ve lit the oven.” “Oh, my dear Papoulakis; if you only knew what a state I’m in,” replied the stricken mother in tears. “My children haven’t eaten, and they want some bread. This evening I don’t have anything to give them, so to trick them into going to sleep hungry, I told them that I’m making them a pitouli, putting a brick tile in the oven as if it were a loaf ready to be baked.” “Open up the pan,” the Saint told her. She opened the pan, and, O wonder of wonders, the tile that had been placed underneath had been transformed into warm bread! “Call the children,” he told her, “and give them some bread; I want part of it, too.” Papoulakis took a portion of the hot bread and went to the village of Kanellata. He left it at a house there, placing it through the chicken hole in the door. The Saint always did such things, whenever he knew that someone was in need. Sophia Lombardou from Anogi relates that one evening, a woman from Anogi was worried because her husband was late coming home. Papoulakis was passing through the area and saw the woman very upset. When she told him about her problem, the Saint immediately consoled her. “Your husband will come;” he assured her, “don’t be so worried and upset. He saw something on the way and was frightened. When he arrives, tell him that he has a bad streak from the top of his head to the bottom of his feet, because he is a blasphemer and is very ill-tempered, and I’m trying to remove this from him.” Her husband finally returned home, explaining that he encountered a column of fire in front of him on the road that prevented him from continuing until he finally managed with great difficulty to get around it. His wife then told him, “Papoulakis told me that you had met some obstruction on the way; through his prayers you’ve arrive here unharmed. He instructed me to tell you that you must stop being blasphemous and ill-tempered; otherwise you can expect much evil to befall you.” Hearing these revelations of Papoulakis, he was overcome by fear and did not blaspheme again. Ioanna Livani from Vathy tells us that one day Papoulakis went to the home of her step-daughter Spyraina, and gave her two oil lamps to keep in her trunk. After about fifteen days had passed, he went and asked her for them. Though she searched for them where she had put them, inexplicably she could not find them and became anxious and upset. Calming her down, Papoulakis asked if he could go and look for them himself. No sooner had he begun looking for the lamps in the trunk that he found them. As soon as Spyraina saw this miracle before her eyes, she began to cry out of awe for the Saint. Mrs. Livani also relates that Spyraina went one morning to light the votive lamps in the Church of Saint Spyridon in Vrysi. On the way she met two military officers. They greeted her, but did not speak to her. Shortly thereafter, Papoulakis came by and, without her having mentioned anything to him, said, “The two officers that you met today while going to Saint Spyridon’s were the Archangels Michael and Gabriel.” Just a little beyond where Spyraina had seen the “officers”, were the ruins of a chapel dedicated to the Archangels. Margarita Moraiti from Ithaki recounts that, one day, Papoulakis went to a home and found them cooking lentils. The holy man told the woman of the house, “Save some lentils for me as well, and I’ll come this evening to eat.” That evening, Papoulakis returned to her home, and they set out the lentils for him and gave him a spoon made of bone with which to eat them. Seeing the bone spoon, Papoulakis reacted. “I have never put a bone in my mouth; do you expect me to do so now?” With these words the Saint gave witness to his ascetic spirit, because of which he had never eaten meat. Abstaining from eating meat is a monastic tradition, and in particular is a part of the Athonite way of life. Angeliki Kallinikou from Ithaki relates that her grandmother, Giorgoulla, had been married for six years without having children. One day she was sitting outside the door of her house, crying. At that moment, Papoulakis was passing by, and when he saw her crying, he asked her the reason for her tears. “My dear Papoulakis,” she replied, "I’ve been married for so many years and I’m not able to have children.” "You’ll have them, my Giorgoulla;” he responded, “you must simply open and tend to three chapels: one to Saint Constantine below Hani, one to Saint John over on the mountain at Spatharata, and one to the Life-Giving Spring over at Stellatata. Giorgoulla indeed tended these three chapels and soon bore children.